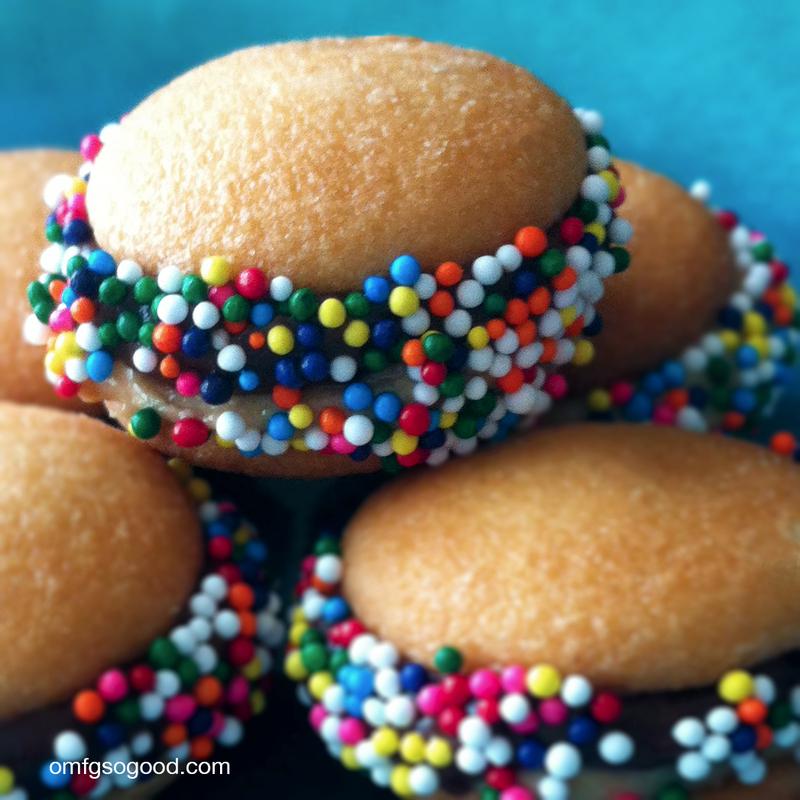 nilla wafer banana sandwiches | omfg. so good. Well now what do we do with all of these Nilla Wafers? If you made the monkey cupcakes I’m sure you’re cursing me out about buying so many of the darn things (in two different sizes, no less.) Yes, you could make a pie or cheesecake crust with the crumbs. But come on, are you actually going to do that or are they going to just sit in your pantry until they expire? Probably longer. Seriously, does anyone really eat them as a snack? Have no fear, Finley and I are here… with a simply delicious solution to your vanilla wafer conundrum. I wish I could say this was my original idea, alas it’s not. I did, however adapt from the original which called for banana slices and straight peanut butter. Our version skips the bananas (only because I wanted them to last longer than a few hours) and combines leftover chocolate buttercream and a creamy peanut butter/powdered sugar blend. These kept very well in the fridge and provided for perfectly poppable little treats. Think tiny peanut butter cup sandwiches. Sounds delish, right? In a small bowl combine the peanut butter and powdered sugar and mix until smooth. Spread a small bit of chocolate frosting on one wafer and peanut butter mix on the other. Sandwich the two wafers together and roll in the sprinkles or chopped nuts. Those look pretty darn good! !